Mike Aberle, the appointed ‘Top Banana’ of Vast Moto, is a self confessed motorcycle tragic. 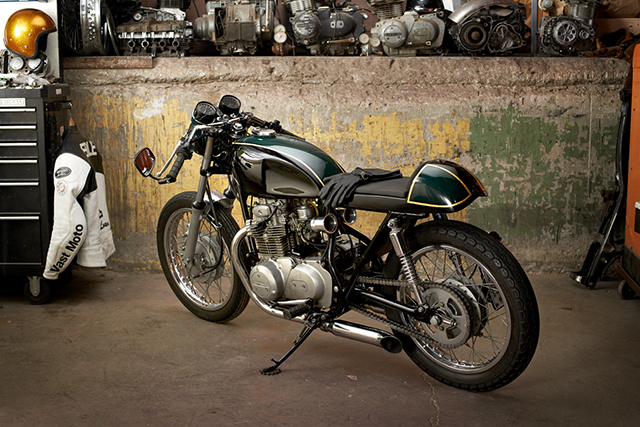 Fifteen years ago Mike was given a KZ900 in return for some masonry work, and the addiction started to take hold. Parked up in a basement for sometime under a sheet, the KZ was given a freshen up and started twelfth kick. It was at that moment that Mike realised he was hooked. A fan of Japanese motorcycles, primarily Kwaka’s, Mike spent the next twelve years working on his knowledge of all things moto. After completing a couple of builds in collaboration with others, Mike wanted to see if Vast Moto could perform a complete frame up build of it’s own. And he had just the bike in mind. The mid 70s KZ would make a great platform for a classy little British style cafe racer, yet keep the reliability of a Japanese commuter bike. To ensure the longevity of the powerplant, the internals were left standard during the engine rebuild. 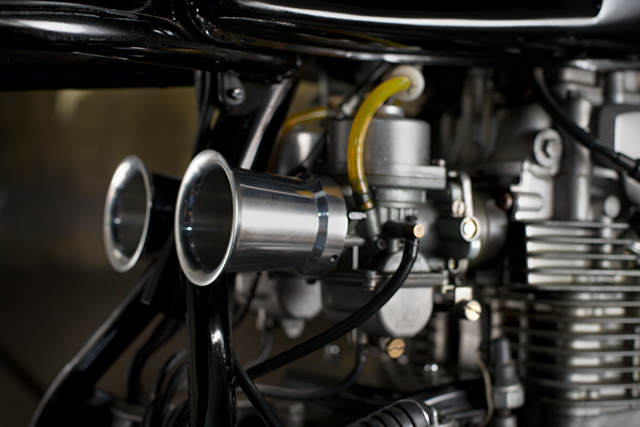 The airbox was swapped out for a set of velocity stacks, and the carbs rejetted to suit the opened up exhaust system. Mike is a fan of the adage ‘simpler is sometimes better’, enjoying the simplicity of a kickstart cranking system. Aesthetically, the bike looks like a million dollars. 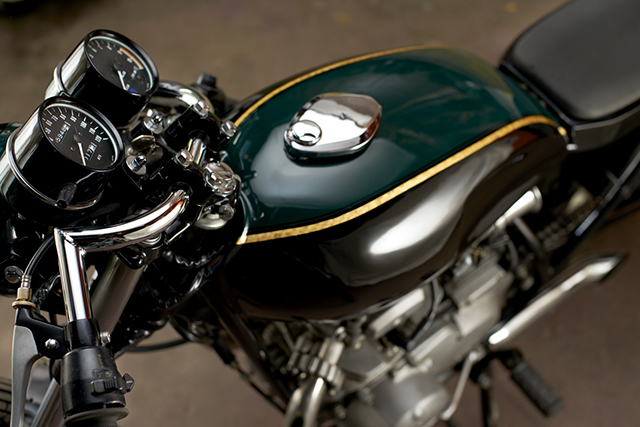 This is mainly due to the 23K gold leaf inlay on the British Green paintjob. 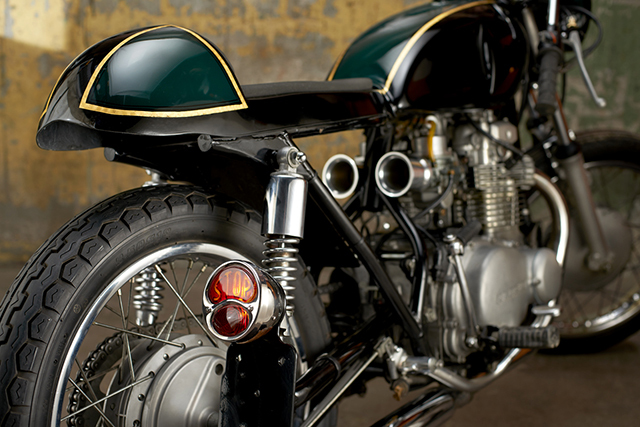 The tank and seat are custom jobs made inhouse at Vast Moto – an aspect of the build that Mike is really proud of. A set of rearsets were considered, but the factory position was retained after measurements showed an awkward riding position due to the small stature of the machine. To keep the frame neat and clutter free, the electrics have been relocated under the beautifully formed seat. In a stroke of genius a battery from an emergency exit lamp has been utilised to minimise the bulkiness of the electrical system. You may have noticed the bike doesn’t rock any indicators, the harness is there but Mike prefers the streamlined look and old school hand signals. 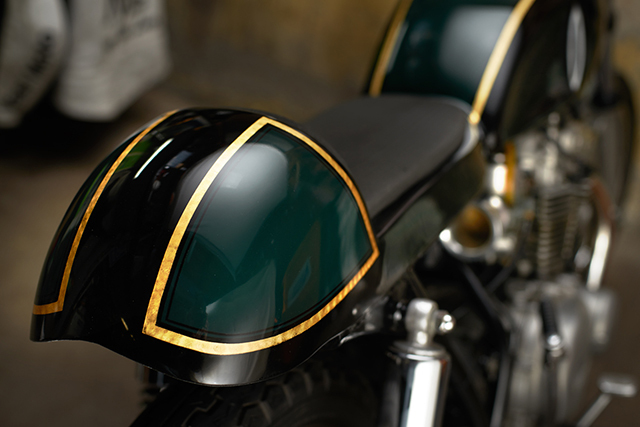 Smoothing the lines of the machine, the headlight and gauge cluster have been dropped using custom bracketry. Although bulky in relation to the rest of the build, the gauge cluster and hand controls help to “keep the KZ spirit alive”. 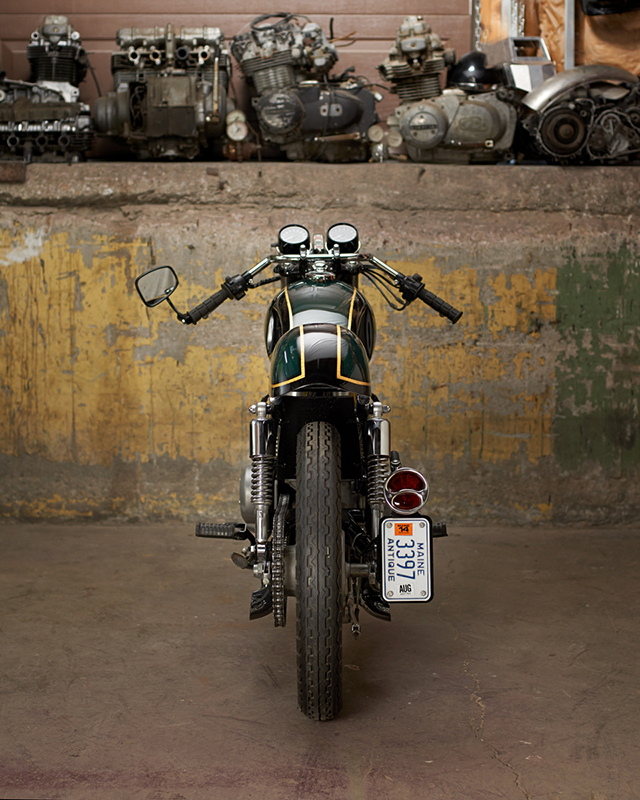 From a chance encounter with a basement find KZ900, Mike Aberle has spent over a decade refining his motorcycle skills. 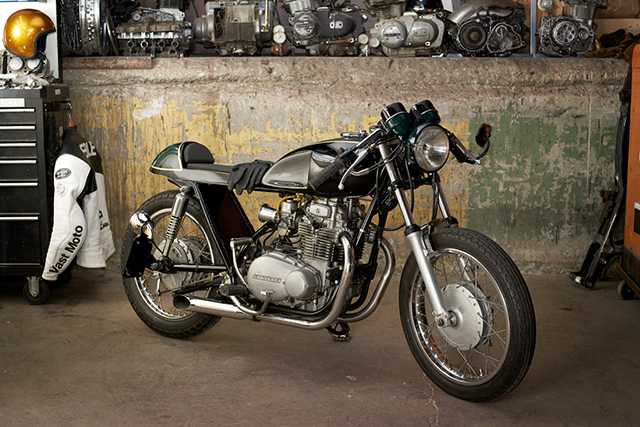 The dream of starting a co-op motorcycle workshop realised, Vast Moto has managed to produce a simple and elegant café racer – all while retaining the soul of this mid 70s small capacity machine. Mike has decided to put the bike up for sale to fund his next project, so if you like what you see then hit him up via the Vast Moto Facebook page.